When you open the Term Browser in translation view, the following search form appears on the left-hand side of the screen. Term Search field Enter a search term . Search button Start a search. Clear Search button Clear the term search field. Search Language dropdown Restrict your search to a specific language. If you select English , the Term Browser only searches within English terms. Tip: The Term Browser saves your selection in a cookie so that your desired search language is remembered the next time you open the translation view. View and select the languages of terms which appear in the linked terms information . Customizable Search Criteria Enter criteria for any additional search fields have been configured by your Term Browser administrator . Tip: By default, no additional search criteria appear in the search form. The criteria in the illustration are displayed only as an example of possible additional search criteria. The option All includes all values that your Term Browser administrator configured as additional search criteria to the search. You can see these values in the drop-down list. The Change button in the Target Languages section enables you to control the display of translations in the Linked Terms column. In the Target Languages section , click the Change button. In the menu which appears, select or deselect the options in the Language menu. Your filter displays a list of English terms. The Linked Terms column displays translations in several languages, but you only want to see the German translations. Click Deselect All and select Deutsch . Tip: The Term Browser saves your selections in a cookie so that your desired target languages are remembered the next time you open the translation view. You can use the translation view properties to adapt the appearance of the translation view to the requirements of the Term Browser users in your organization. The Acrolinx Server administrator is responsible for setting and maintaining the translation view properties. To change the translation view properties, you must access to the termbrowser.​properties file in the Acrolinx Server configuration directory. translationview.searchForm.searchableFields Configure a list of additional search criteria which appear on the search form. Enter the values as a comma-separated list of field names. When entering the values, use the name defined for the field in the field manager component of the Acrolinx Terminology Manager. The field name appears in the first field of the Edit Custom Field dialog. The fields appear on the search form in the order that they are listed in the property. Configure the default source language or source language pair. When you search for terms, the Term Browser looks for terms in the configured source languages. If your organization works in two main languages, you can configure both of them as source languages. For example, you can search for source terms in English and German at the same time. When you enter a search term, the Term Browser suggests matching terms from both languages. When you configure two source languages, Term Browser users can select two search languages from two search language dropdowns. You cannot configure any more than two source languages. Also make sure that your configured source languages are included in the property translationview.searchForm.searchLanguages as well. translationview.columnSelector.initialColumns Define the columns which display in the search results grid . The columns term name , status , language , and linked terms appear by default. The columns appear on the search form in the order that they are listed in the property. Configure the linked terms column to only display translations or synonyms which have a specific status. By default, all translations and synonyms are displayed in the linked terms column regardless of status. Enter the values as a comma-separated list of status names. translationview.searchResultList.singleResult Configure Term Browser to jump directly to the term help page if your search finds only one term. By default, Term Browser displays a single search result in the search results grid . 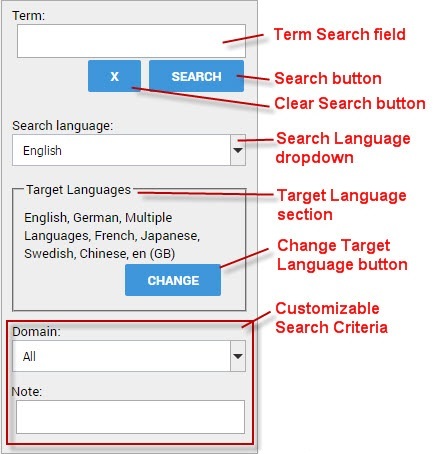 translationview.searchForm.allowMultipleTargetLanguages Configure whether users can select multiple target languages when searching for terms. If set to true , the search form contains a multiple selection menu to filter for multiple target languages. If set to false , the search form contains dropdown menu to filter for one target language at a time. When this property is not set, the default behavior is true . translationview.searchResultList.displaySynonyms Show or hide synonyms in the linked terms column. translationview.searchForm.searchLanguages Restrict the range of search languages available to users in the search language dropdown. If this property contains one language value only, the search language dropdown is hidden from the search form , and the defined language becomes the default search language for all searches. translationview.searchForm.targetLanguages Restrict the range of target languages available to users in the target language menu or dropdown. If this property contains one language value only, the target language selection menu is hidden from the search form , and the defined language becomes the default target language for all searches. Restrict the range of options available to users in other list fields that you have configured to appear in the search form . Enter the values as a comma-separated list of list item names. When entering the values, use the name for the list item as defined in the category manager component of the Acrolinx Terminology Manager. In the category manager , the list item name is displayed in parentheses next to the display name. All values are case-sensitive. When adding a field to the Term Browser properties or the term help template, you are required to enter the name defined for the field in the field manager component of the Acrolinx Terminology Manager. Field Name Configurable as Template Variable? Configurable as Custom Search Field? Configurable as a default Column?